On the way to my “30 by 30” travel goal, it has always been my biggest delight to visit a new country. Yes, partly to tick off another one in my bucket list. But more so to discover new cultures, see new sights, and meet new people. So when Karla invited me to join her in Sri Lanka recently, I just had to let out a big fat YES! We will write more about our whole Sri Lankan adventure later on. But first stop: Sri Lanka’s capital city, Colombo. 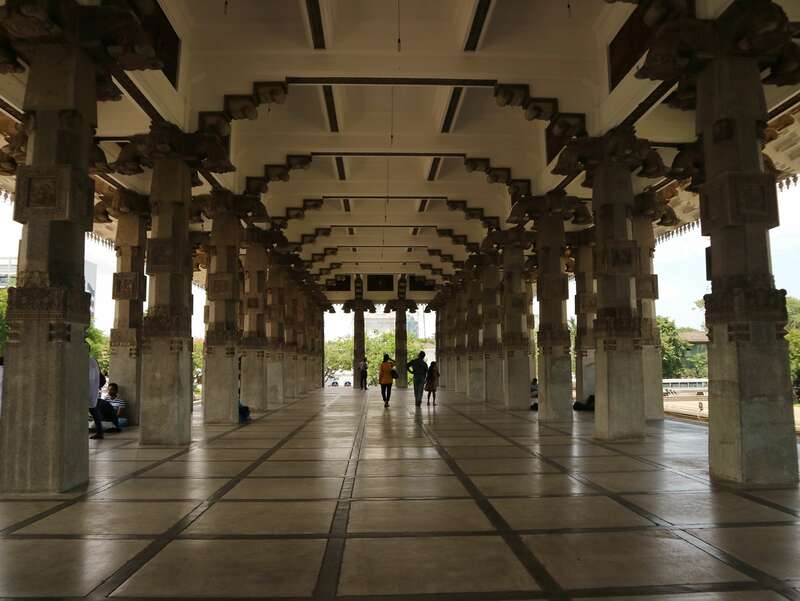 Here’s what to see, do, and expect on a Colombo City Tour with Urban Adventures. Google’s my bestfriend so as soon I found out I had solo day in Colombo, I hurriedly search on things to see, do, and eat in the city. I was travelling alone so I figured it might be best to go on a guided tour. And that’s where I bumped into Colombo by Tuktuk by Urban Adventures. Now I know for a fact that Karla has worked with them before so I had complete confidence it was a good tour company to deal with it. And I was right! Just a few hours after my initial e-mail inquiry, I received a reply from Tammy. A few exchanges and further research, I was booked for a Colombo City Tour with Urban Adventures! 2. Bring only the essentials. I cannot stress this enough. I usually overthink on what to bring when I’m out and about. So I always end up bringing a lot of stuff, including a big bag and a big water bottle. Since everything will be taken cared of, you just need a few essentials. Like a camera, phone, tissue, and some cash. They’ll even throw in a bottle of cold water before the tour starts. Well just in case you end up bringing more than you should, no worries. Because the Colombo by Tuktuk by Urban Adventures had its own designated Tuktuk and trusted driver. 3. Read your tour voucher carefully! It’s a good thing I checked back on the e-mail from Urban Adventures and found out there was no hotel pick-up, just a set meeting area. Which brings me to my next point…. 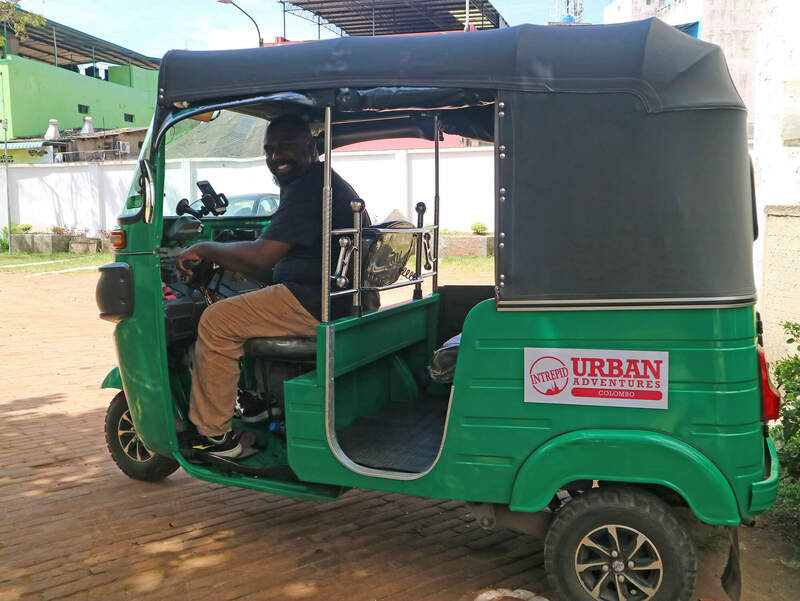 Colombo by Tuktuk by Urban Adventures starts promptly at 8:30 AM. So be sure to arrive a few minutes early or be in the vicinity ahead of time. In my case, I was coming from Negombo so I opted to book at Citybeds- The Regent Colombo (more on this later). The hotel was a mere 5-7 minute walk from the meeting place. My driver was just kind enough to wait for me and bring me by car. 5. Wear something nice yet comfortable. The tour includes visits to some local temples so be sure to wear something nice and decent but still comfortable. I opted to wear loose pants and a tucked in shirt with sandals to pair. Turned out to my favor as we visited two temples that required shoulders and legs to be covered. While footwear are requested to be taken off inside temple grounds. As mentioned, Colombo by Tuktuk starts promptly at 8:30 AM. Designated meeting area is at the Dutch Hospital Shopping Centre. 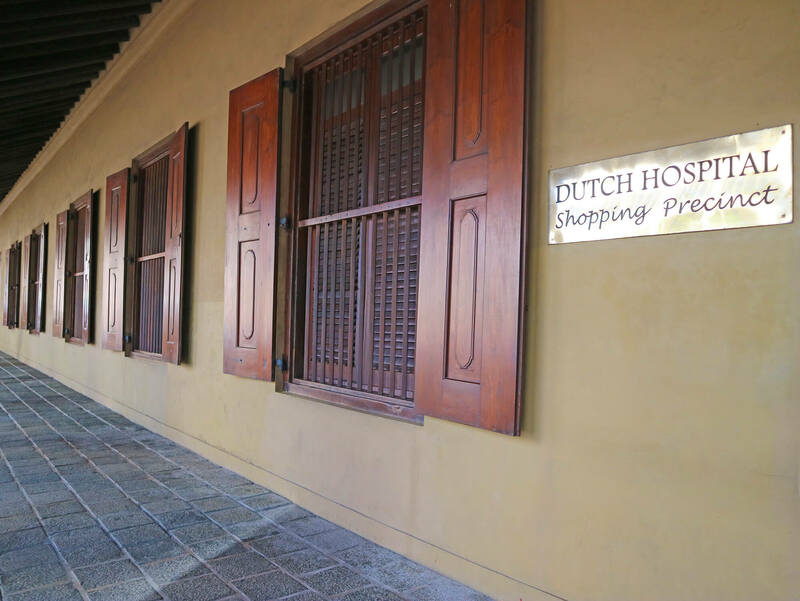 Considered to be the oldest building in the Colombo Fort area, the Dutch Hospital Complex should be easy to spot as it sits right across the World Trade Centre Colombo. Anyway, a few minutes after our tourguide Sujith (an ex-banker) arrived. That day there was only this Aussie guy and I on the tour so we promptly started. 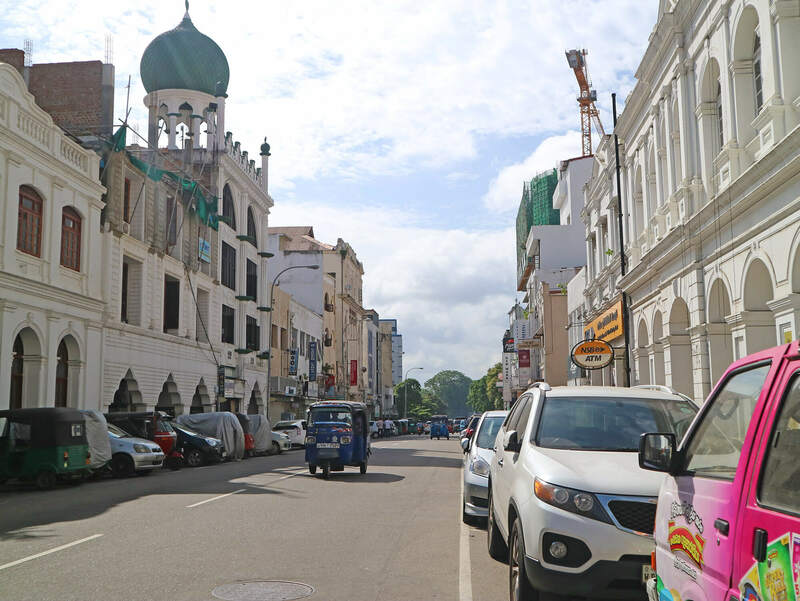 Now before we hopped on our Colombo by Tuktuk, Sujith huddled us inside the shopping centre’s courtyard for some tips and quick history about Sri Lanka. Which I honestly appreciated because: 1. I’m a big history fan and 2. I like to know the story behind the places I visit. The island nation is made of several ethnic groups, with the Sinhalese making up 74.9% of the population (22.8 Million), mostly Buddhists. Followed by the Tamils at 11.1%, who are confined to only a handful of areas in the north and east of the country. Their civil war just ended in 2009, after 30 long years. Sri Lanka was under the rule of three (3) empires: Portuguese, Dutch, and British. Thus the influence in infrastructure, culture, and language. 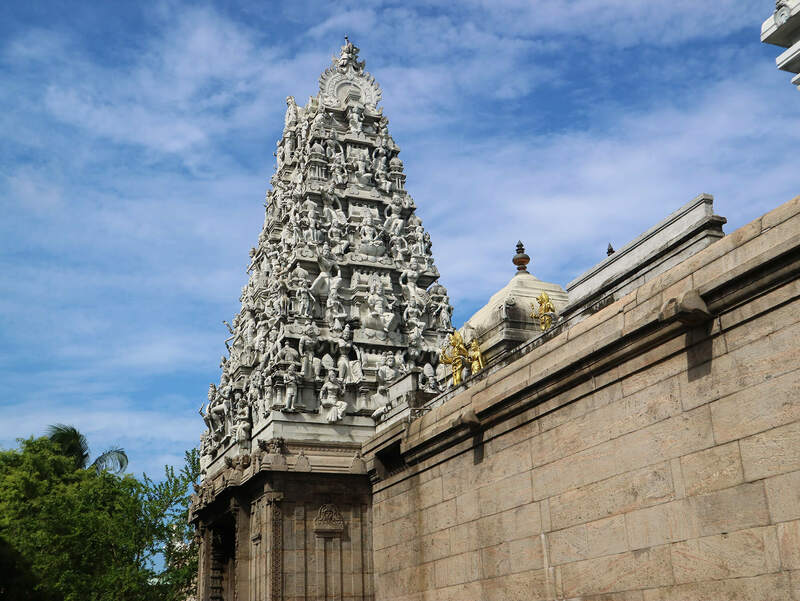 Also called Kovil Veediya, this is the oldest and one of the largest Hindu temples in Colombo. Soon as we stepped out the temple, Sujith asked that we take off our footwear and leave them in the designate ‘locker’ area by the temple gate. Walking towards the main entrance, Sujith gave us a quick history about Hinduism and the temple itself. The temple has been around for over two centuries and is dedicated to the gods Ganesha and Shiva. I loved the fact that everything was hand carved, including the intricate beams located inside. Which leads me to 2 quick trivias! 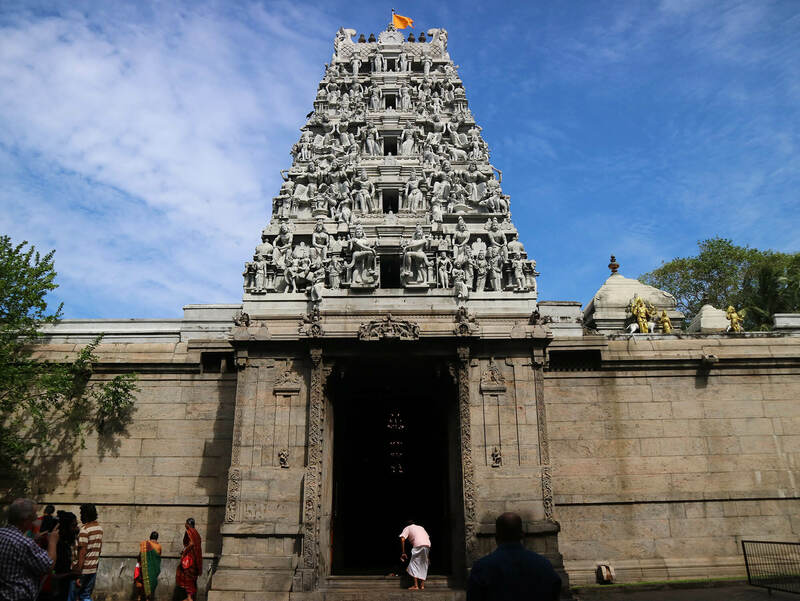 Trivia 1: Did you know Kovil Veediya has 6 openings in its main gate? Each representing the Chakras, with enlightenment being the last? Trivia 2: did you also know that the Hindus have 33-330 Million Gods in their religion? Just look at all that detail! Can you believe that’s all hand craved? To pay respect, we had to cleanse our feet with water before entering the temple. Once inside, I couldn’t help but marvel at how mystifying the whole place was. It was dim, sacred, holy. People were praying on all corners, giving thanks and praise, offering prayers and intentions. It was all surreal. 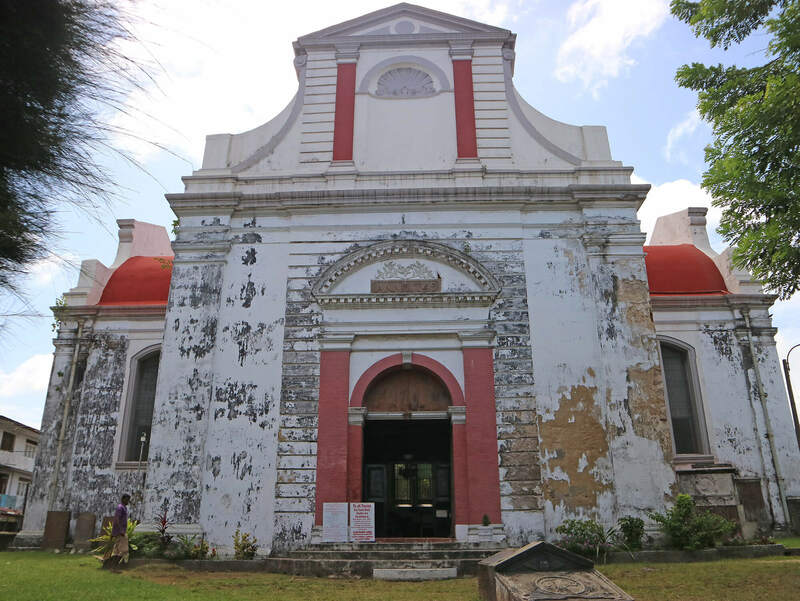 Next stop on our Colombo city tour was one of the most important Dutch Colonial era buildings in Sri Lanka, the Wolvendaal Church (Wolvendaalse Kerk). Founded in 1749, it’s one of the oldest Prostestant churches still in use in Sri Lanka today. One interesting feature of the church is that it’s actually built on top of a cemetery. Creepy yet very interesting at the same time! There are three (3) masses heard in Wolvendaal every Sunday in Wolvendaal. One in Tamil, another in Singhalese, and the last in English. Although brief, I highly enjoyed passing through the busy streets of Pettah Market. 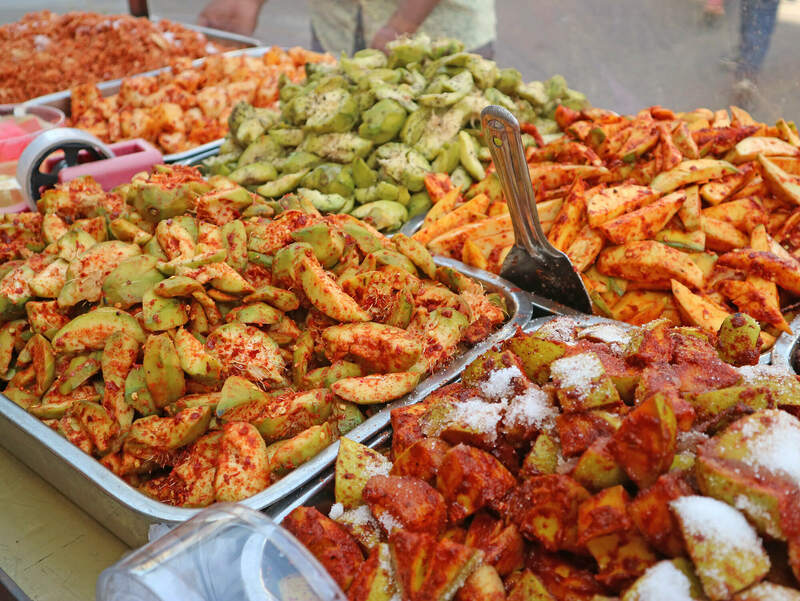 The place was noisy, sprawling, brimming with fresh produce and unique commodities. It was all too exciting for me (more on the area soon)! It was a hot, humid day so being served a King Coconut for a drink was so refreshing! Tip: Be on the lookout for the famous Jami Ul-Alfar Mosque or the Red Mosque just along the main road! 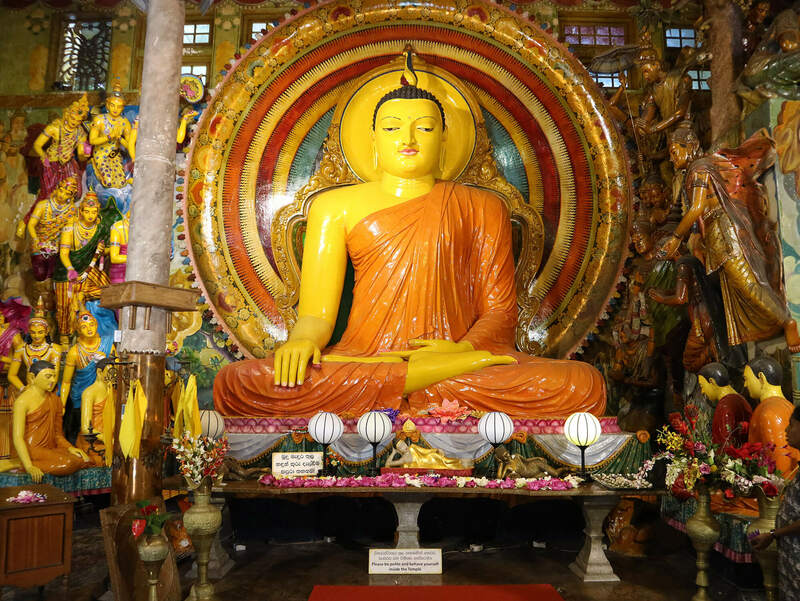 Not to miss in your Colombo by Tuktuk tour is Gangaramaya Temple. 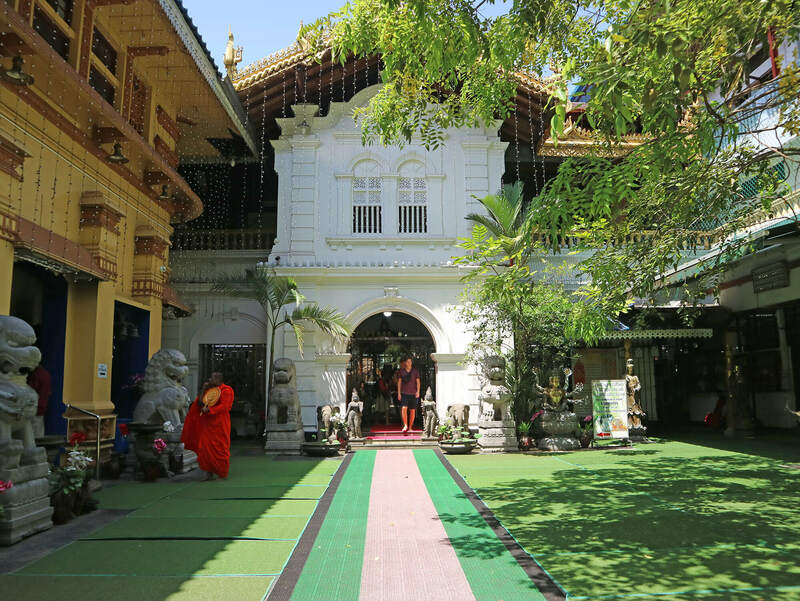 The Buddhist temple stands as one of the most important landmarks in Sri Lanka. Precisely because it’s a beautiful mix of modern architecture and religious significance. And second, because it contains a larger collection of Buddhist statues from Japan, Sri Lanka, Thailand, Burma, and China. Trivia 3: Gangaramaya Temple features the smallest Buddhist statue in the world. It measures just 3mm, made of gold, encased glass. Can somebody please pass the magnifying glass? 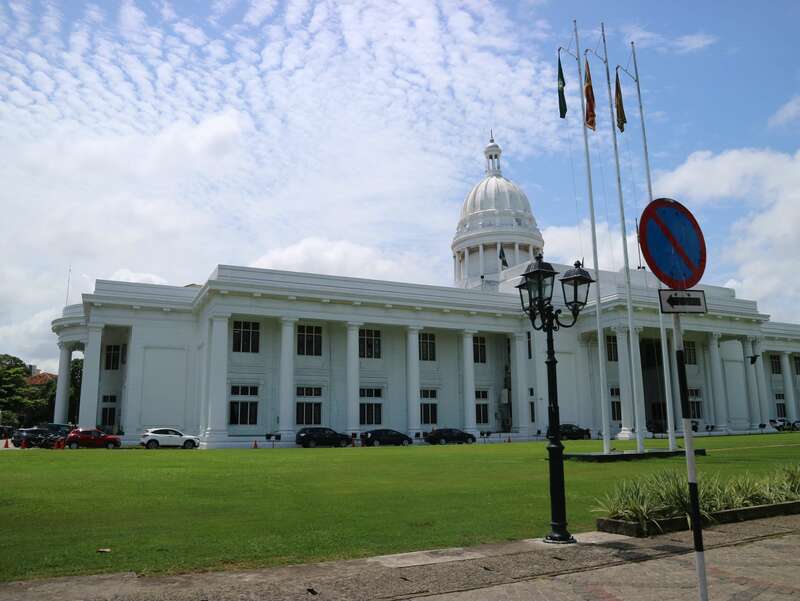 Completed in 1953, Colombo’s Independence Memorial Hall is a national monument built for commemoration of the independence of Sri Lanka from British rule on February 4, 1948. Currently, the Hall serves as a venue for Independence Day celebrations and other national events. Otherwise, the open spaces also cater to the needs of fitness enthusiasts and other relevant activities. The Colombo city tour should last for around 3.5 to 4 hours. And should take you to at least 5-6 places for the day. Mostly historic and religious landmarks around Colombo. What I enjoyed most that Sujith was polite, on time, and very knowledgeable. I had a lot of questions along the way. And he happily answered them best way he could. 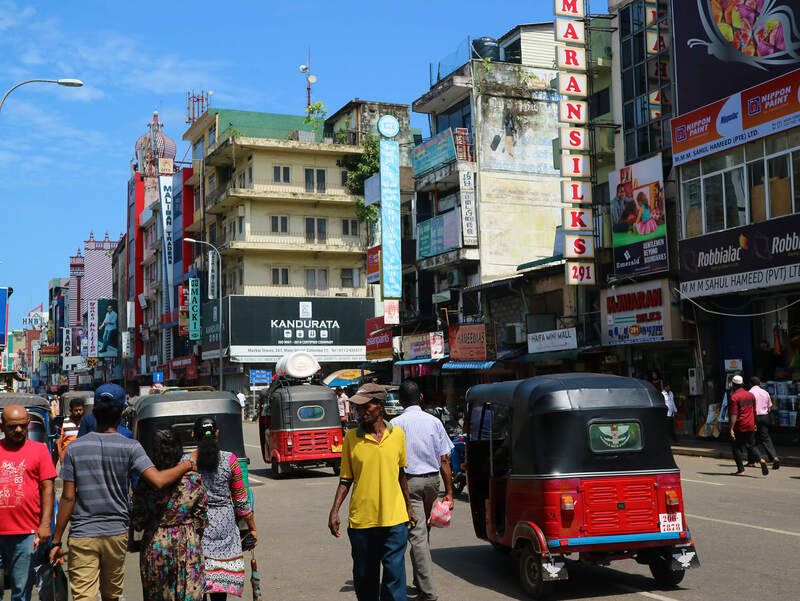 All in all, I think Colombo by Tuktuk by Urban Adventures is a great way to see Sri Lanka’s capital city. It’s quick, fun, and hassle-free! And after all, there’s nothing like seeing a new place through the eyes of a local, right?